"33 E Cedar offers affordable units starting in the $200s in a fantastic location with nightlife and restaurants just a block away on Rush Street." 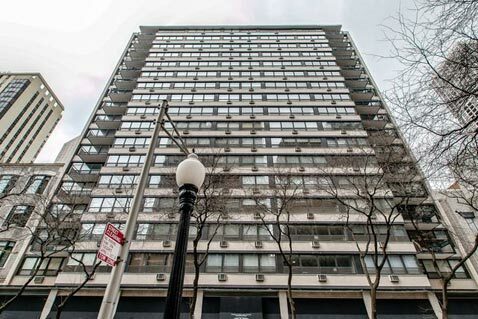 33 E Cedar is a mid-rise condominium building in Chicago's elite Gold Coast neighborhood. Residents of the building are just moments from numerous first-class restaurants on Rush Street, a short walk from shopping on Michigan Avenue, and less than a block from the lakefront and Oak Street Beach. 33 East Cedar offers a great affordable option with 1 bedrooms starting the $200s. Building amenities include a fitness center, 24-hour door staff and a common sundeck for enjoying Chicago summers. Though 33 East Cedar was built in 1958, although many residences have been renovated over the years. Some units have balconies and many feature picturesque views of the quiet tree lined street and glimpses of the lake. 33 E Cedar is a pet friendly building.